The newly released Joyetech eGo AIO is styled in a way that simplifies vaping in the best ways possible. It is a streamlined electronic cigarette with a preinstalled 2ml atomizer that is permanently attached to the battery. It has an anti-leaking structure with a top fill childproof system, and a top coil as well. With it’s easy to maneuver design, all you have to do is simply push down and unscrew the top cap to fill it or change your coil. It comes with many built in safety features including the classic 5 on/ 5 off button press, over charge protection, short circuit protection, and over current protection. These features along with its 1500 mAh battery provide a reliable and long lasting battery life between charges. The Joyetech eGo AIO also has a pass thru charging function located on the side of the unit, giving you the freedom of vaping while charging. The Atomizer will show a recommended max fill line and has an airflow control valve located on the top. 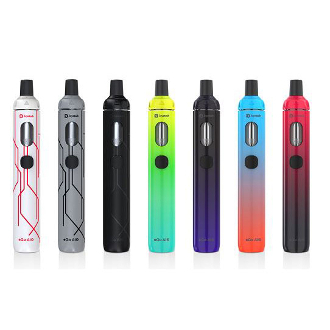 Besides having features that make for a perfectly customized vape hit, the AIO allows you to personalize your battery by picking which color you want on display as the indicator light.